One of my complaints about modern horrors is that they rely too much on the quiet-loud school of scaring people. The whole shouting “Boo!” to make you jump has a limiting effect and after a while, it becomes lazy and boring. A Quiet Place uses this technique throughout but it’s there for a reason. The film is about being quiet, for the second you make a noise, you are risking your life and everyone you love. Other horror filmmakers, take heed. This is how you do it. The world has become almost a barren wasteland where most of the human race has been wiped out by some alien creatures who hunt by sound. The Abbott family, living on a farm, spend their time quietly moving around in barefoot, never speaking but using sign language and being careful never to make a noise. They are preparing for the birth of Evelyn’s new child, while Lee tries desperately to contact anyone on a makeshift radio system. Their children, Marcus and Regan, a young girl who is deaf, must live day to day with the fear that one slight sound, they could come under attack from these deadly creatures. The simplicity of the idea is incredible. We’ve all seen films where the slightest sound could cost you your life but it’s never been done so efficiently and to the point where you end up with your heart pounding so fast, you’re even afraid that the noise will trigger something. 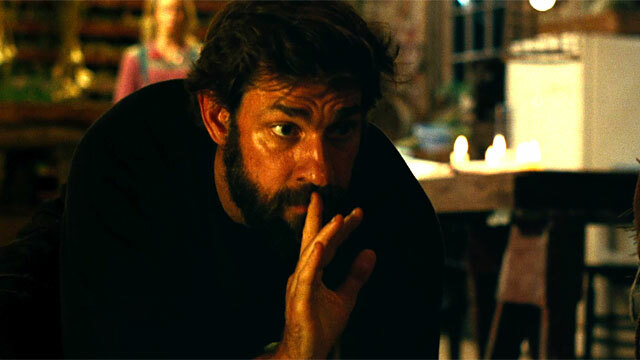 Director and co-star John Krasinski, who has never made a horror film before, has created one of the tensest, nail-biting films ever, which demands a viewing in the cinema. From the second the film starts, we are told very little about where we are, what has happened and who these people are who wander around a deserted store without making a sound. The power of Krasinski’s direction is that very quickly we get to know everything and by the time the titles appear, we get the feeling we are going to be put through the wringer. Krasinski careful sets up future events without having to hammer things home. He gives you enough information for you to immediately think “that’s not going to be good” and then leaves you wondering when the inevitable will happen. Every inch of this film, which runs at a perfect 90 minutes, takes its grip and refuses to let go. I have always said the best horrors are those in which you care about the characters and this is true here. We follow this clan and we don’t want any harm to come to them, which makes the shocks even more effective. There are plenty of set pieces to tighten your stomach and you spend the film wondering how they are going to conclude these events and it is the skill of Kransinski’s direction that you are constantly left guessing and when things are resolved, they are done in a manner that is believable.I also have to celebrate the soundscape. This is a reason you have to see this film on the big screen. The slightest noise is picked up and hangs in the cinema helping build the tension. You won’t get this level of sound at home. A horror film is only as good as the performances involved. This is the first time that husband and wife Krasinski and Emily Blunt have appeared on screen and this makes the relationship between Evelyn and Lee runs true. The chemistry is certainly there but it is Blunt who brings a whole new level of performance to a horror film. You cannot believe how good she is here, particularly when the terror is focused on her. You feel every inch of her pain. The children, Millicent Simmonds and Noah Jupe are excellent too, bringing a non-pretentious approach to their roles that make you care what happens to them. They suffer just as much as we, the audience do. There have been some great horrors over the years: Jaws, Alien, The Shining, I could go on. I think that A Quiet Place will end up being mentioned in the same breaths as those films. I have never left a cinema feeling so shaky. It gobbles you up and spits you out, leaving you both entertained and as tense as a winded-up toy. You’ll also leave emotionally drained, something most horrors can never achieve. Krasinski is not only a likeable presence on screen but a director we need to keep a good eye on. This is a superb horror and I very much doubt we will see better this year!